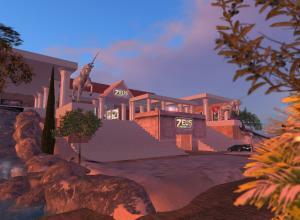 Zeus Gay Club is one of the most popular Second Life gay clubs and is located on Gay City Estate, currently one of the top voted sims in SL (data: July-August 2009). Having been recently completely renovated, Zeus Temple, with its impressive decoration, one of the largest dance floors to be found, the best dance animations around, an overactive sploder, its well known and up-to-date DJs and, mostly, its warm and lively regulars, will become your own favorite joint as well! Was this helpful? YES - NO - 83% of 6 users found this review helpful. This is home to me, and to a lot of my friends. Here you find the friendliest people, best music, and memories to last a lifetime. If you have never been there, you are missing out on the best club in Sl... and if you dont believe me, just go there once and you will find out for yourself. Was this helpful? YES - NO - 100% of 5 users found this review helpful. It´s a crowdy international place with great djs and interesting people. Warm and family atmosphere. Was this helpful? YES - NO - 100% of 4 users found this review helpful. Above being a spectacular place to listen to great DJs and enjoy the best Second Life aesthetics, Zeus Gay Club is a place where you can feel a member of a big virtual family. It was one of the first places I found when I started exploring SL and it immediately became my favorite, my home place. After a couple of years, I feel very lucky that I have become a member of that family. Thank you, Zeus!